Most evangelical posters at this time relied heavily on Christian posters to address the need for producing understanding solely on image rather than words. This poster shirks that idea right off the weirdly drawn cliff. 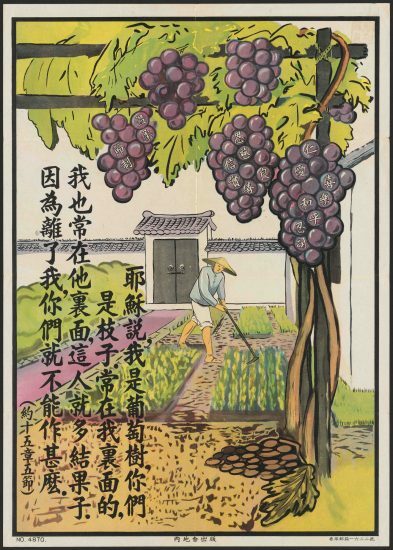 Although this poster does extend a hand to the Chinese populace by relying heavily on traditional styles for many of its elements. Joseph Ho discussed how Christian missionaries, after being in the Chinese culture for a few years, began to change how they photographed those around them in support of the culture (2012). Much the same way, this poster draws each person in traditional Chinese dress, although without the men having a queue since it was made after the fall of the Qing dynasty. 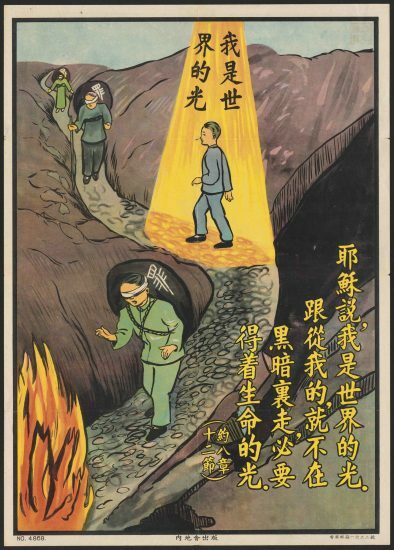 It is easy to distinguish the typography of the Chinese mountains that were used as a reference for the background of this poster and the cobblestone path leading down into the flames. With each person being blindfolded and carrying bulging bags on their backs, it is simple for the eye to be drawn to the one person that is different from the rest. He walks with his head held high and a light shining on him from the heavens. So, initially, it is easy to spot that this man is different from the rest solely based on the imagery. Although, absent from the poster is a full understanding without fully understanding the text, which tells the reader that the bags are “sin” and the man is different because he is under the light of salvation. In conversation with other Christian posters at the time, this poster stands out as failing to fully convey the idea of Christianity to an illiterate response. So, who were the people trying to reach at this time? With the growth of the New Life Movement at the time, there was perchance an increasing percentage of people with literacy, but this poster was spread in the more rural parts of China. So, the publisher seems to have forgone understanding his audience or he was aiming for a higher tier of social class within the Chinese population? If you had grown up in a Christian household, you would have an innate understanding of the importance of grapes and vines within the Christian religion. Many Biblical stories revolved around these elements to demonstrate the salvation that can be found through Christ. Yet, since wine was never the most popular drink in China, there is a cultural divide that has to be straddled by the publisher of the posters to address the differences and propagate understanding of the Christian message. There has once again been an attempt made by the publisher—The China Inland Mission—to perchance change the drawing to more suit the Chinese audience. They have illustrated the character as hoeing fields within traditional Chinese architecture while wearing traditional garments. Yet, like the previous poster, this image relies heavily on the text to convey its full idea of Christianity. The text is even in the foreground, thus taking the most important place in this poster. It reads as a quote from Jesus saying that he is the vine and that His followers are the branches, and without Him, you cannot do anything. And beyond that, the grapes carry the various “Fruits of the Spirit”. Once again, this poster lacks the ability to speak to an illiterate audience with the obvious absence of Christian symbology that could speak on its own. And the image even goes against the text, because the man is by himself and sowing his own field. Within the Christian faith in China at the time, evangelism was important and working with the Confucian tradition in promulgating the idea of working together as a society towards salvation. Yet, this poster speaks against that with the man hoeing the field by himself. Maybe the publisher was showing the Christian idea that to help others that you first must help yourself. Yet, that would also not be clear, but to a higher level social tier and people already familiar with the faith. So, has the publisher solely done the surface layer of merging with Chinese culture at the time? Did they feel that it was enough to simply don the person in traditional garb to connect with the society at large or were they aiming for a different group of people within mainland China? The final poster in this exhibit could potentially be the most confusing to those who are illiterate. With the most traditional of art styles out of the series, this poster depicts a little girl eating out of a bowl with writing on it. She is obviously part of the countryside, since she is surrounded by fields and mountains and a single trail next to her. She has a smile on her face as she outs of the bowl with chopsticks and is wearing a traditional outfit. Without the text, this poster simply conveys the image of a happy, fed little girl. During this time, the countryside was still struggling to feed its population and there always the threats of floods and droughts that truly controlled the amount of food available. Yet, the text is the only aspect of this poster that exhibits the Christian origin of the image with the bowl of rice actually being the “bread of life”. Then the text on top of the poster is once again a quote from the Bible about how the Lord is the bread of life and that none will go hungry through Him. And the poster does depict this sunny scenery with trees full of fruit to truly show the depth of meaning behind those words. Yet, as exampled by the other posters of this exhibit, there are limitations to this poster solely in its inability to speak to those who are illiterate. Once again, without the text, this image simply portrays a happy little girl who is able to eat, which could spark the interest of the audience with the promise of being able to provide for the family. This also could work in tandem with Confucianism’s idea of being able to support the family. But it also speaks against the importance of male children in the Chinese culture. For example, in Joseph Ho’s article he shows a story from the Henke’s of a man willing to sell his daughter to be able to pay for food for him and his son (2012). 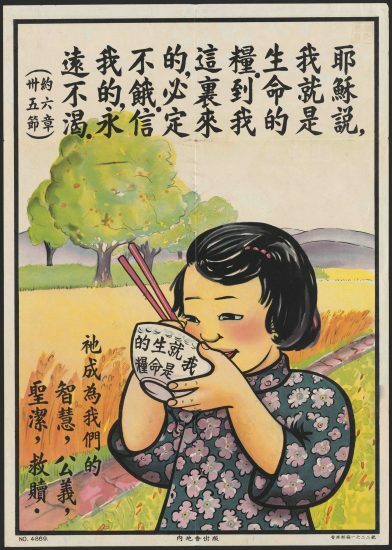 This poster, though, depicts a female child that is able to eat, so perchance the publisher is seeking to demonstrate that there is enough even for females. All in all, this poster raises the question again of ignorance of literacy of the population or aiming for a different social class. This issue has been brought up throughout the exhibit, especially since it has been the same publisher throughout. With a severe absence of Christian imagery, the publisher could be trying to hide the influence of Christianity initially to the audience, thus preventing the immediate dismissal of the posters. Or they could be looking at a social class that is familiar with the Christian ideology and literate. Yet again, the argument against this train of thought would be the fact that this mission is aimed directly at the inland of China. During this time, this area would be more controlled by warlords and farther away from the educational centers of the coast. Thus this area would be densely populated with those unable to read or have contact with foreigners. So, the publisher appears unable to fully merge with the Chinese culture around them, because they are not speaking to all of those they could reach with further symbology and relying heavily on text. Images are stationary in this temporal world of ours and as such, they provide the best window backwards. Whether it is propaganda or evangelical posters, the message has to be able to come across from the moment they are printed to the time they are read. Years after being printed, though, they show a glimpse into what was considered important enough to be placed into paper memory and the perspectives of the publishers. Looking further into the Chinese Christian posters, it is important to remember Joseph Ho’s words in his article “In our Image” (2012). In it, Joseph Ho speaks of how images are not to be taken as the truth, but as “lenses” that show how the world was perceived at the time of conception (2012). Each publisher’s perspective influences the image and consequently the way we should view the image in later times. So, for my exhibit, I chose to explore three images that made me question what the publisher’s perspective was when pushing the posters forward. These three posters, although not made by the same publisher, raised questions within me about how they would have been perceived by the public. What unites these posters is initially the lack of Christian symbology within the image and how it seemed a little off from Chinese culture at the time. For example, the first two posters contain messages from the Bible, but are not adapted for the public. One of them states that the Lord is the “bread of life” while a little girl is eating out of a bowl. If I was illiterate, I would not have understood the full meaning of the message, thus not receiving the light of Christ. Even the final poster contains this conundrum that the viewer has to be able to read about Christ being the Light of Salvation and that the bags are “sin”. Questions are raised about the effectiveness of these posters that lack the traditional symbols—a cross perchance or prayers—and rely solely on the person’s literacy. With further examination, more questions arise within each poster and its context within history. Ho, J. (2012). In our image: Visual perspectives and American protestant missions in interwar China. UCLA Historical Journal, 23(1) 43-61. Retrieved from https://cloudfront.escholarship.org/dist/prd/content/qt6t42318v/qt6t42318v.pdf?t=m5jkdf.